This page sponsored by Golfholes.com. Take the Walt Whitman Bridge to Route #42 South to the Blenheim/Blackwood (168 South) exit (10a). Bare right off the exit ramp go to the first stop light and make a hard left onto Coles Road, follow Coles to the first traffic light, turn left and proceed to dead end intersection. Turn left and the clubhouse is on your left. Green Fees Please refer to the Valleybrook web site for up to date green fees and specials. Comments The Valleybrook Country Club is an 18-hole Semi-Private golf club located in Blackwood, New Jersey. Ron Jaworski's championship golf course presents challenges to golfers of any handicap. 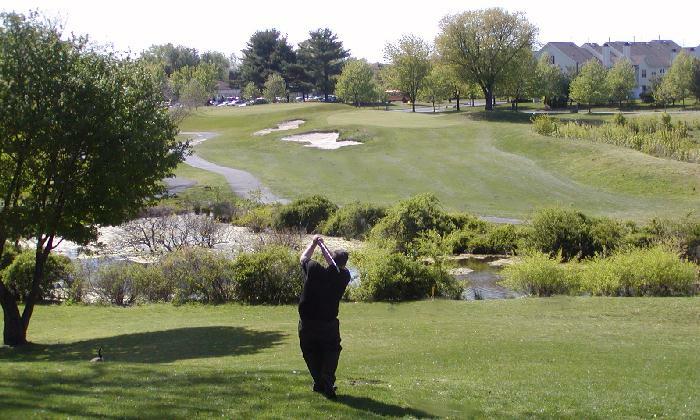 The rolling hills with wetlands and mature tree lines offer scenic panoramic views, unlike most flat New Jersey courses in the area. Golfers will find water coming into play nine times throughout the round, as well as, great elevation changes. Pictures don't lie so take the tour. A view of the 18th approach at Valleybrook Golf Club.